The second (and larger!) 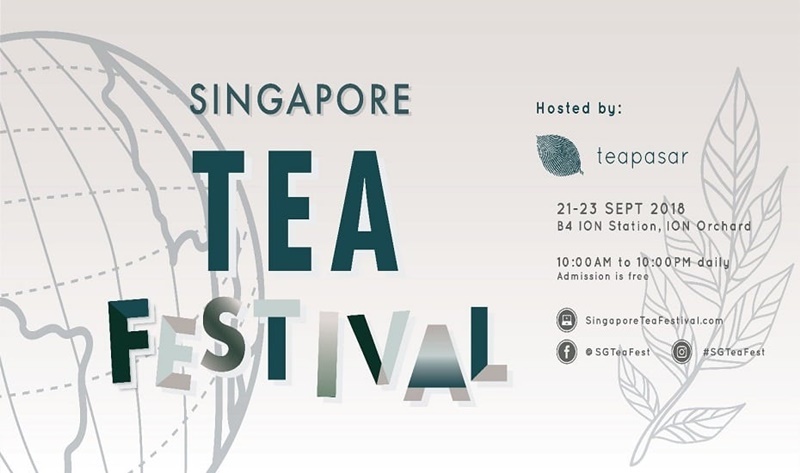 edition of Singapore Tea Festival (STF) 2018 is back from 21st – 23rd September at Basement 4 of ION Orchard. This year’s STF is proudly organised by teapasar (www.teapasar.com), the world’s first global omni-channel marketplace powered by machine learning taste prediction technology. It features an extensive range of local and international tea brands, as well as exclusive and rare tea direct from farms that consumers can purchase. teapasar comprises three pillars namely the tea marketplace, ProfilePrint and Taste Map. ProfilePrint is a taste profile mapping and metabolomic fingerprinting technology that powers teapasar by creating a unique fingerprint through the scanning of tea leaves. This allows teapasar to accurately match consumers’ unique taste preferences to the profile of every tea on the teapasar database. While many feel the need to taste tea before a purchase is made, consumers can now discover their preferred tea and explore similar options with teapasar’s taste profile algorithm. 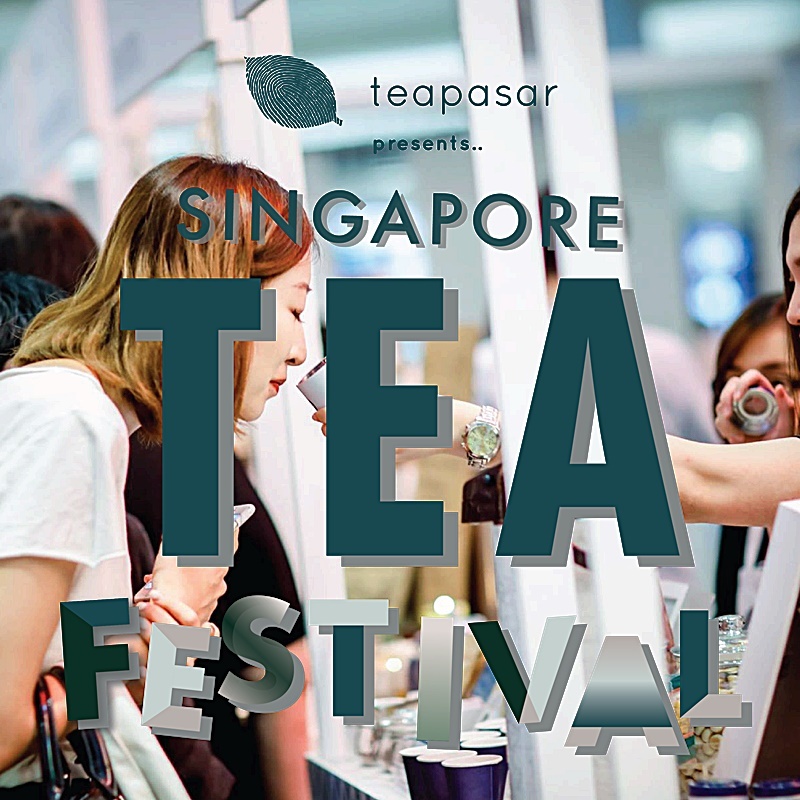 At the festival, consumers can first create their personalised taste profiles and browse the offerings online, then sample the teas at the merchant booths, and finally make purchases online at teapasar.com. In pursuit of the drive towards a more convenient, cashless Singapore, teapasar has partnered with NETS to introduce QR code payment options for this year’s festival. This will allow consumers to scan the NETS QR code on the webpage, while those on mobile can make payment directly through their NETS ATM card on NETSPay. 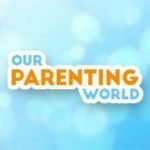 This year’s STF is bigger and better with 28 exciting tea and tea-related brands, and 3 days’ worth of educational and engaging workshops to look forward to! From TIMELESS CLASSICS featuring single-origin tea merchants such as Tea Chapter and Parchmen Academy, to MODERN BLENDS by many of Singapore’s very own tea brands with interesting blends inspired by local flavours such as Durian Tea (SUCRE) and Nyonya Kaya (The 1872 Clipper Tea Co.); to Botanically Cold Brewed (TM) Sparkling Teas (Gryphon Tea), and even 100% compostable tea pods that are also compatible with Nespresso® machines (A.muse Projects). This year’s STF will also feature INTERNATIONAL FLAVOURSsuch as Matcha soft serve (Matchaya), and teas direct from Japan (Ito En) and Indonesia (Bali Organic Tea). There will also be LIFESTYLE-related merchandise – from quirky tea illustrations by Troops On Print, to hand-crafted ceramics by Euphoramics and &Natural. At this year’s STF, teapasar hopes to bring a seamless O2O2O (online-offline-online) experience to both tea enthusiasts and tea novices and see you there! Visitors can redeem a complimentary Yixing Purple Clay glazed porcelain cup by registering at teapasar’s booth, allowing them to sample teas from all its merchants. A $5 discount will also be given to first time users of teapasar who spend a minimum of $50 on the platform. 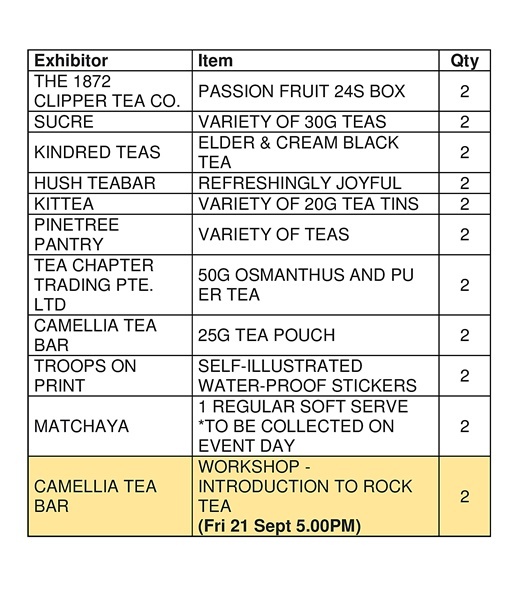 Thanks to the organisers of Singapore Tea Festival 2018, teapasar, we have 2 sets of tea packages consisting a variety of tea and tea-related items and tea workshops from the brands who will be participating in Singapore Tea Festival, totalling $154.40 each for 2 lucky readers. 2 winners will be chosen, one from Facebook and one from Instagram. Hurry, giveaway will close on 16 September at 23:59Hr. Winners will be announced and notified on 17 September, please check this space for announcement.